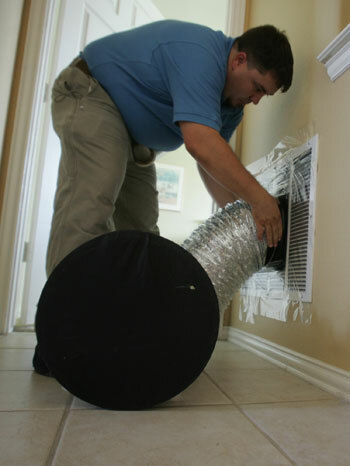 Setting up a duct blaster test, from the Dallas Morning News. In today’s DMN I have a story about tips for reducing energy usage. I visited three homes of different ages with efficiency experts from three different companies. The point was to find out what energy issues might be common to homes of particular ages. After doing all this, my conclusion is that every house is different, and that anything related to the A/C is most important when figuring out how to reduce energy. That, and change your light bulbs to energy efficient ones. The paper version has some additional tables and graphics, and the front page (yes, of the entire paper) has a blurb at the top, so pick one up. Check out the story I wrote for today’s Dallas Morning News Home section. It’s about a conservation development east of Dallas. 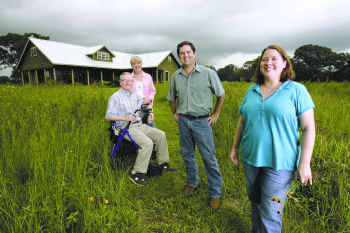 The Woodson family turned their farm into an eco-friendly development. If you’re interested in reducing your electrical consumption, you’ll save more by making changes where they count most. A high efficiency, Energy Star-rated DVD player is great, but it won’t cut your bill the same way a super cool new fridge will. 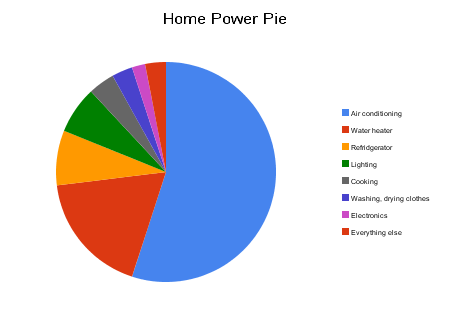 To illustrate this point further, I’ve put together what I’m calling the “Home Power Pie,” which shows the approximate proportional breakdown of electricity on an average home’s monthly bill. the effect that using less hot water could have on your bill.